These anti candida diet good foods are designed to starve candida yeast by keeping the blood sugar levels even and avoiding blood sugar spikes from eating sugars and grains. It is these spikes and sugars in the blood and intestine that feeds candida yeast. If conditions are right, candida yeast can double its population in one hour. So you can see how important the diet really is. You could take the strongest candida chemotherapy drugs in the world but if you feed the beast I highly doubt you'll get rid of this. Its just like cancer, which coincidentally also feeds on sugar. As a matter of fact, there are some doctors that think cancer is caused by candida and other fungi. Many anti candida diets will promote the alkaline diet and this does improve one's health and that is important, but it also helps yeast grow. It also does not necessarily improve cellular health. The reason for this is, most alkaline foods lack essential fats and those good-fat foods usually fall on the acidic side of the chart. The cell wall is 40% fat and 60% protein and is permeable, so nutrients pass in and waste passes out. This process happens easily when cell walls are made from good fats, but feed the body bad fats and it will use what you give it to make new cells. Bad fats reduce the cell permeability and the cell walls become hard. No longer is the cell getting all the nutrients it needs or getting rid of all the waste. Besides, candida can live from a ph range of 2.5 to 8.0.Your body maintains blood at a ph of 7.365. Now, for that 7.365 to get to 8.2 does not sound like a lot but the odds of you getting your ph above that figure are very slim. Why? Because the body will maintain that 7.365 level if at all possible. It will dump the minerals it uses like excess calcium and potassium in your urine and if the level falls too low, it takes those minerals from the bone and uses them to maintain that ph level. Yes you can get your ph levels up short-term, but long term, no way. So you would constantly have to eat high alkaline foods on a daily basis and this would deprive you of the needed fats for healthy cells. And those cells all put together make up your body. All those soft tissue cells are also replaced every seven years or less, so you want to make the best of the best of cells. If you don't eat protein and good fats this is not going to happen and you're going to pay for it in declining health and degenerative diseases. I have tried to make this anti candida diet good foods list as complete as possible but more than likely I have missed something, somewhere. If you discover a food that is not on the list below and question it, then I would check the carb index. If the food is low carb and is not in the candida diet bad foods list then go ahead and eat it. However, if that food gives you a problem or contains high amounts of fructose then of course stop eating it. Beef liver, chicken liver, organ meats, bacon, beef, buffalo, chicken, duck, goat, goose, ham, lamb, ostrich, pheasant, pork, quail, spare ribs, turkey, veal, venison, wild game, cornish game hen and free range eggs. When it comes to fowl, don't buy into the white meat is better for you, if you do not like white meat. If you like dark meat your body is telling you it needs the extra fat this meat provides. Of course it is best to eat free-range chicken and grass fed beef if at all possible. Grass fed beef is far superior to regular commercial beef because of the fatty acid ratio. Grass fed is around 3 parts Omega 6 to 1 part Omega 3, commercial beef is around 20 parts Omega 6 to 1 part Omega 6. Omega 6 fats in high doses cause inflammation and disease. Omega 3 does the exact opposite and also makes healthy permeable cells. Bologna, frankfurters, sausage, and salami can be eaten occasionally, read the labels looking for the addition of starches, sugar and fructose. Anchovy, caviar, herring, mussel, sardine, abalone, arctic char, clam, crayfish, crab, lobster, octopus, oyster, mercury free wild salmon, scallop, shrimp, snail, squid, catfish, cod, flounder, grouper, haddock, mahi mahi, perch, red snapper, black cod, scrod, sole, tilapia, trout, turbot, and white sea bass. I would avoid tuna unless you're getting certified mercury free. Shark, swordfish, mackerel and farm-raised salmon, Atlantic salmon is farm-raised, are not a good idea either because of high mercury levels and other toxins. All herbs, asparagus, green beans, bok choy, broccoli, butternut squash, green and red cabbage, sauerkraut, savoy cabbage, cauliflower, celery, chili pepper, green chili peppers, cucumber, eggplant, endive, escarole, fennel, kale, all lettuce, fresh mushrooms, okra, onions, green onions, green peas, snow peas, green and red peppers, jalapeno peppers, radicchio, radishes, rhubarb, shallots, spinach, spaghetti squash, summer squash, swiss chard, tomato, turnips, watercress, and zucchini. Generally, if it grows above ground it is ok to eat. Carrots are a very controversial food on the candida diet, I have seen one yeast infection diet say yes and the next say no so here's my take. One medium carrot contains 7.3 carbohydrates, which is not to bad. They have been said to be anti-fungal and keep the yeast infection from spreading. If you cook carrots it raises the glycemic index to double that of a raw carrot so if you are going to eat them, eat them raw and limit it to one or two a day. Mushrooms are also a very controversial food. Fresh mushrooms are very low carb, dried mushrooms are not. Shiitake mushrooms are high carb, maitake mushrooms are not. Both are medicinal and have been proven to boost immune function. Do they help candida grow, shiitake would because they are high carb but I doubt maitake would. It's your call. What Nuts Can You Eat on the Candida Diet? Eat unsalted almonds, brazil, filbert, hazel, flax seeds, macadamia, pecan, pine nuts, pumpkin seeds, sesame, sunflower seeds, chestnuts and walnuts. Real butter, sour cream, ghee, natural low sugar yogurt - FAGE brand at Whole Foods Market, kefir, avocado, coconut, olives, coconut oil, flax seed oil, macadamia oil, olive oil, pumpkin seed oil, sesame oil and walnut oil. If you have any skin conditions that you believe are a result of yeast, I would eliminate ALL dairy, including the yogurt. Also, you are going to get some fat from the meats you eat. If you find yourself wanting to snack between meals then raise your fat content at meals. A great way to do this is with coconut oil. Not only is it a great fat but it also kills candida. What Fruits are Good on the Candida Diet? All these fruits are low carb, under 10 grams a serving, and I feel would be ok every now and then while on the candida diet. You have to stay healthy and some fruit does have its place. You also cannot cut off all carbs, the red and white blood cells need them to function correctly. Candida will also go into survival mode if you eat zero carbs and produce an enzyme that helps it convert fat to glucose for survival. This could force it deeper into the body tissues. If any of these fruits cause a problem for you, stop eating them. I would not exceed more than one serving per day. I would not go over 60 grams of carbs per day, that's all the body needs. However, Dr. Al Sears says the body is fully capable of making carbs from fat and protein so the thing to do, would be to listen to what your body is telling you. If you experience fatigue and headaches from the lower carbs, try increasing the amount of water and salt you consume. If that doesn't work, you are probably going to have to add some carbs. Fresh apricots and fresh plums. 1/2 cup serving size: blackberries, blueberries, cherries, cranberries, plums, raspberries, and strawberries. 1/2 cup of tomato, unsweetened grapefruit, lemon, and lime juice are all ok.
What Grain Carbs are ok on the Candida Diet? There are quite a few diets out there that allow grains but generally I suggest you keep them to a minimum because they are rapidly turned to sugar during digestion. A typical serving of one cup quite often contains way too many carbs that will induce a blood sugar spike. However, the alternative grains, those free of gluten and non gmo are ok once in a while. You should also be aware of the carb load. Carbohydrates per 1/2 cup serving. I suggest you keep the serving size equal to 20 grams of carbs or less. Can I Drink Alcohol on the Candida Diet? "Alcohol consumption statistically significantly decreased oral carriage of mutans streptococci, whereas there was no effect on Candida albicans colonization levels. 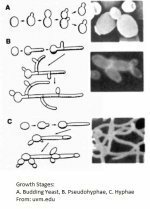 Tobacco users were found to harbour elevated levels of C. albicans; however, there was no observed effect on bacterial colonization by mutans streptococci." But, this study that was published in the Journal Microbiome in 2018, showed that alcohol altered the good bacteria levels in the mouth. It seems pretty obvious to me that since you swallow it, it is going to alter your intestinal microbiome as well and that could influence candida growth in the intestine. So if I was going to drink while doing this diet, because yeasts prefer sugar as a carbon source for growth, I would avoid high sugar alcohols. So here's a list for those of you that have to have a drink every now and then. All are very low carb and have very few calories. 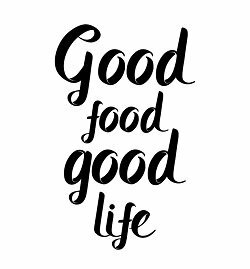 Because low levels of good bacteria is probably what started your problems to begin with, while you are on the diet and taking probiotics, enzymes, etc; it is a good idea to feed them daily. Good bacteria like to eat the fiber from vegetables but there is also a fiber out there that has been shown to really make them grow at a rapid pace, it's called Resistant Starch(RS). RS resists digestion and the body cannot absorb its glucose content in the small intestine. However, once it reaches the large intestine, good bacteria feed on it like crazy. Bad bacteria will try to feed on it as well but stool testing shows their numbers go down in a big way. It seems the bad bacteria attach themselves to the RS and when you have a bowel movement, they are disposed of. No studies have been done as far as yeast goes that I know of but once again, stool tests show that yeast levels will not increase if you consume no more than 20 grams per day in your diet. Eventually, by following the diet and the protocol below, the biofilms and yeast are eliminated and the good bacteria levels return to normal levels. Long term treatment for 6 months shows good bacteria levels through the roof, while bad bacteria numbers are greatly reduced below the average person. Yeast is non existent. However, if you feel uncomfortable using these while doing the cleanse because it might feed the yeast, do it after you have it under control for 6 months. Be very careful with these three below, they are still high carb. The sweet potato and kidney beans need to be cooked, then refrigerate over night and consume cold the next day. Plantains are best sliced thin and dehydrated into chips. Make sure you rotate these, don't get stuck using the same one over and over again, your bacteria need a variety of food. 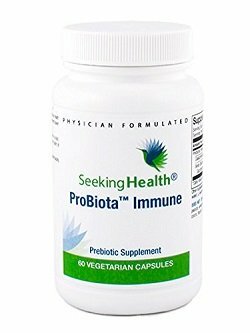 Probiotia Immune has actually has been shown to grow bifidobacteriums and acidophlius almost twice as fast as the resistant starches. This is a good option for people that are not comfortable with taking rs. Even better than Probiota Immune would be Floraphage. Studies have shown that Floraphage increases the growth of good bacteria 2400%, and 500% over the FOS prebiotic known as inulin. The best thing is, it does not feed yeast in any way. I would then take Biofase and either Profase, or the 11-strain probiotic at bedtime and again one hour before breakfast. This combination will completely transform your intestinal environment in a big way... for the better. Natural peppermint tea will be very soothing on your digestive system while on the candida yeast diet since it helps manage yeast die off, as well as nausea, abdominal fullness, or pain. Try to drink four 8-ounce glasses of distilled water a day, and four glasses of bottled, reverse osmosis, or spring water to keep the body flushed of toxins. That about does it. If you do not see a candida diet good food here check the bad foods list and if it's not there then refer to the carb and glycemic index. High carb and high glycemic foods should be avoided. Sometimes candida yeast is not the problem at all but the problem is actually food allergies, so I strongly suggest you keep a food journal so you can monitor how particular foods make you feel. Short of being tested for allergies, a food journal will help you identity problem foods. Commonly Asked Candida Diet Questions? Why can't I drink coffee on the candida diet? It has been said that coffee causes a release of sugar by the liver. However, I have not tested this to see if it is true or not? I had two cups a day with no ill effects when I followed this diet for a year so I doubt a couple cups a day would hurt you, definitely skip the sugar. What's the best milk to drink on the candida diet? Why no cheese on the candida diet? If you are going to sit down and eat piece after piece it can cause a blood sugar spike from the lactose. However, I do think when used as a condiment like on lettuce wrap tacos, a little would be ok.
What breads can I eat on the candida diet? Generally, almond or coconut flour breads are best but you still have to watch the amount of carbs. How long should I stay on the candida diet? I can't answer this, everyone is different and will have this to different degrees. Obviously, the worse it is or the longer you have been dealing with this problem, the longer you will need to be on the diet.